It is anticipated that the deadline for paying Immovable Property Tax will be extended to allow the authorities sufficient time to print, file and send registered property owners tax demands. A DRAFT BILL to extend the payment period for Immovable Property Tax to November 15 will be put before the Cabinet in the next few weeks but the tax brackets will not change. According to reports, the extension of the time period from September 30 to November 15 was necessary to enable the appropriate department to print, file and send property owners the owed tax amounts. The time needed for printing the letters is estimated to be approximately two and a half months, not including placing them in envelopes and mailing. Reports claim that the government is in no position to change the new tax brackets that were passed in the plenary a few months ago, as it was not possible to gather the necessary information from property owners whose property value exceeds the value listed on the land registry’s records. Meanwhile, president Anastasiades has requested that the information be re-assessed as gaps had been found in the taxing of property which had been developed and gained greater value but was presented at the land registry office as simple plots. Based on recent legislation, the government expects to receive €100 million of the estimated €130 million in taxation of property following deductions that will be made as part of its Troika commitments. Property ranging from €170,001 to €300,000 will be taxed at 1.1%, property worth €300,001 to 500,000 at 1.3% and for property worth between €500,001 and €800,000 tax will come to 1.5%. Finally, any property that is worth between €800,001 and €3m will be taxed at 1.7% and for anything above €3m tax will come to 1.9%. @davross – My view is to get to your local Inland Revenue office pay by the deadline of 31st August and receive a 10% discount. Even if the bill is passed, there are more than 350,000 tax demands to be delivered. What are your thoughts on Magda’s question? After all, the Bill may not be passed by the Cabinet. Do we hold our nerve or do we jump? Please remember that the tax bands are based on the 1980 value of property – not their current market value. (Please refer to my earlier article – Money off your Immovable Property Tax bill). Does this mean that people should wait until they receive the demand by post? Friends have visited the local IR, and were told they have to pay before end of August. Any further IPT payments should be frozen until the Government have re-assessed and revalued all of the Land titles with un-registered properties sitting on them. Then we should all be able to pay our fair share of IPT instead of subsidising the usual suspects who have been getting away with it for years. Usual shambles. Just another example of how lax all government controlled matters, including Tax had become. My wife and I decided to calculate and pay our (discounted) â‚¬67.50 each anyway. We’ve also paid our (local) ‘Council Tax’ for this year (all of â‚¬150!). On a similar properties in the UK we were Paying Â£1800 p.a. Per property. 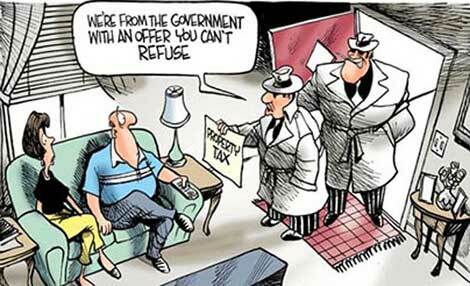 Many Cypriots we know are refusing to pay their taxes anyway on the grounds, apparently, they haven’t paid them before! I wonder if the cut off date for the 10% discount will also be moved? @Michael – Currently the tax is payable on the total 1980 values of all the properties registered in the name of the taxpayer. So if a taxpayer has three properties with 1980 values of â‚¬60,000, â‚¬45,000 and â‚¬75,000, their tax liability will be calculated on their total value – â‚¬180,000. The tax will be on each property’s 1980 value doesn’t matter if the owner have more properties or on the total value of properties in each person / company name? Well, what a surprise. Glad I didn’t rush to pay my IPT – perhaps I won’t have too when it is all abandoned as too difficult.